We announced the initial dates of our fall tour today! Most dates are with Underground Railroad to Candyland (San Pedro, CA - Recess Records). If you don't know about URTC or Todd C or Recess Records, you should!!! These guys are life long punk rockers and over the last few years have made some of our favorite albums with URTC and Stoned At Heart. Check out this documentary to get caught up! Recess Records from Mike Plante on Vimeo. ALSO!!! 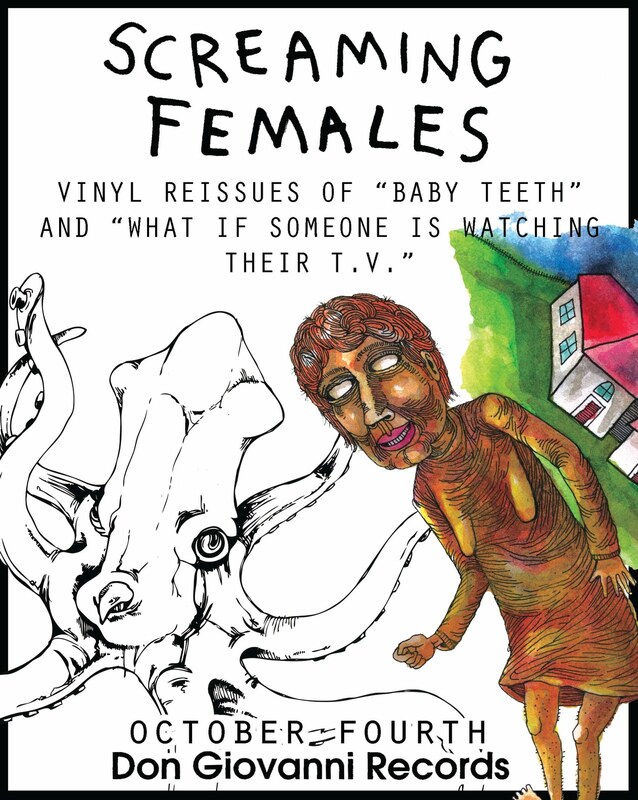 On Oct 4 Don Giovanni Records will be reissuing vinyl of our first 2 full lengths Baby Teeth and What If Someone Is Watching Their T.V.? These have been long out of print and I guess we just got tired of people asking us where they could find them. Here is the pro blurb about the reissues. It's been 6 years since guitarist/vocalist Marissa Paternoster and bassist Michael Abbate crammed into drummer Jarrett Dougherty's attic to write and record their earliest collaborations as Screaming Females. The band was young (Michael was still in high school) yet already focused. Rather than placing those recordings on a CD-R demo or waiting for a label to approach them, Screaming Females opted to self-release a real album with real packaging. The record was Baby Teeth, their aptly titled debut. This was just the tip of the iceberg for the trio, who quickly discovered and jumped headfirst into a national DIY punk network. After numerous basement shows around their home state of New Jersey and a few short tours, Marissa, Michael and Jarrett decided their next effort needed a proper studio. The band decided not to utilize normal studio wizardry and instead opted to simply set up their gear and play. Many songs were recorded in a single take and the record saw few overdubs. Through these raw recordings the band attempted to capture a true representation of the louder and faster sound they had developed. Creating this new, deafening punk soon had its consequence. During one practice an irate police officer issued the band a noise violation and insisted they had to consider neighbors who could be trying to watch television. Befittingly, the next album was titled What If Someone Is Watching Their T.V.? To celebrate the release of this second album the trio embarked on a 70-day national tour, beginning their reputation as one of the hardest-working bands in North America. Their dedication hasn't gone unnoticed. This past year has brought their television debut, sold out headlining shows and tour dates with legendary names such as Ted Leo and Against Me! As a way to thank the fans, Screaming Females are reissuing vinyl of their first two albums, which until now were only available at early shows. Baby Teeth and What If Someone Is Watching Their T.V.? out October 4 on Don Giovanni Records. And last, but not least, if you pre-order both vinyl reissues you will get a FREE live Screaming Females 7 inch. There will be a very limited number of these. More info on the pre-orders coming soon! No Canada??????? Please come back to Toronto!!!!!! You are so close!! You should play in San Pedro! We'd love to have you. I have plans for Halloween now! I can't wait! My brother linked a performance of "Normal" on Facebook. Not normally my bag, but I thought you folks were fantastic. Enjoy Hangar 9 in Carbondale -- I ended up in a fetal position there many a night maybe before any of you were born. Make sure you hit Pagliai's for a slice right out the door or the Bagel Man for a cucumber-and-cinnamon, or Fred's Dance Barn in Cambria for unintended hilarity.